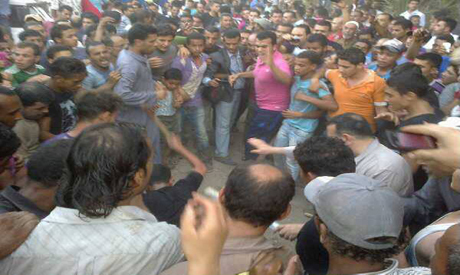 Angry Mob Beating a Shiite in Zawya Abu Muslam village "Source:Hazem Barakat"
An angry mob led by Salafist sheikhs torched and attacked houses of Shias in the small village of Zawyat Abu Musalam in Giza governorate Sunday afternoon, killing four citizens including a prominent shia figure. Not less than 3000 angry locals attacked houses of Shias in the village Sunday afternoon after weeks of incitement by Salafist preachers, according to eyewitnesses. Five houses were set on fire during the attack. Police are evacuating the rest of the Shia residents from the village. At least four have been killed according to the head of the Giza security directorate. According to eyewitnesses, there are not less than 30 badly injured Shias who have been transferred to hospital. The death toll included 66-year-old Hassan Shehata, a prominent Shia figure who was jailed twice under former Egyptian president Hosni Mubarak for "contempt of religion." The police force came late according to eyewitnesses and did nothing to stop the attack and public lynching. "They were just watching the public lynching like anyone else and did not stop anything," said Barakat. "We hold President Morsi responsible for this attack," said Bahaa Anwar, a Shia activist. "There are not less than three million Egyptian Shiias who live in Egypt and last Saturday during the Syria solidarity conference attended by Morsi in the Cairo Stadium, Salafist sheikhs insulted Shias and incited hate against those Egyptian Shia citizens," said Anwar, adding that President Morsi did not refute these insults and incitement, though he claims to represent all Egyptians. The outspoken Shia activist told Ahram Online that there are not less than 40 Shia families in Zawyat Abu Muslam village. "Some of the families managed to leave while there are families who are still besieged in the village." Anwar said that Shehata was visiting one of the Shia families in the village when the attack happened. Salafist Islamist TV host Khaled Abdullah claimed that Hassan Shehata was attacked because he insulted the Prophet Mohamed's relatives, blaming Al-Azhar for being silent on Shias in Egypt hours after the attack on Al-Nas TV channel. Several Salafist and conservative Facebook pages, like "The Muslim Coalition to Defend the Prophet's Family and Companions," also bragged of the murder of the Shias, claiming that that was just the beginning of ending Shiism in Egypt. It is really an unfortunate situation for umma. I can only remind my brothers about the incidents happened with Abuzer e Ghaffari, Mohammed ibn Abi Bakr etc who were pious muslims & met similar incidents. I dont know anything about Mr Hassan Shehata & his collegues, but for sure Allah shall put him in the same catagory. I am shiite & love my muslim brothers alike. I love all my brothers of all faith, folowers of all religions of books. These are the teaching of prophet Mohammed & his family of 14 infallibles. Not Sunnis but Wahabism is the cult that have no logical arguments to prove its affiliation with Islam. its followers use inhuman acts to suppress the true followers of Islam just like Yazeed did the same with imam Hussein the Grand son of prophet of Islam in Karbala. Do you people think that those criminals will stop at killing Shias? No, they start with Shia, then they will attack Christians and Bishops, then Sufis, then Baha'ies then Normal Sunnis and Azhar Olama, later on they will turn on each other and start bombing themselves.. The prophet told us about them but no one act against them. We,muslims from India request you to take actions against the Salafi leaders and the people involved in this heinous crime against Humanity. We strongly condemned this act of Shia Killings in Egypt. What do you expect radical Islamists to do? Just wait until they find the last of the Egyptian Jews, then next will the the Coptic Christians, then the bikini wearing tourists. Muslim countries will never experience true freedom. Ah, the wonders of Islam. Its been this way for 1400 years. I think it’s the start of Muslim decline that is the ultimate objective of non Muslims. The clerics, general public who are fulfilling this cause of anti Muslims will be answerable to God definitely. Why do you call them "angry" when they should be called criminals? Where is Morsi? and where is the police? and where is the Egyptian justice system? But as I say hate mongers and criminals start with one group and in the case of Egypt it is the Copts and now this disgusting criminal attack against the Shia so who is next? The whole bunch of Giza police should be fired on the spot and brought to justice.